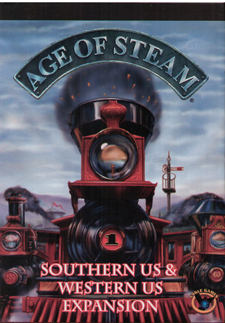 Age of Steam: Expansion maps for the Southern US & Western US are exciting new additions for the highly popular Age of Steam board game series. The Southern US map ranges from New Orleans to Raleigh and from Memphis to Jacksonville. Cotton goods are used in this expansion which focuses on the Old South. The Western US Map ranges from Los Angeles to Duluth and from Seattle to New Orleans. This game has special rules involving the transcontinental networks.